This year for Thanksgiving take a break from the chaotic grocery stores and dine out for the holiday. Many Restaurants around Las Vegas are serving traditional turkey dinners with a culinary twist. So, instead of slaving away basting a Butterball, take the family out to one of these local destinations to give thanks. Spend Thanksgiving atop the Palms Casino and Resort surrounded by views of the twinkling Las Vegas strip. Alize, a Chef Andre Rochat restaurant, presents a six course prix-fixe menu this year featuring classic favorites as well as culinary specialties. Each course featured surpasses the previous, from the Roasted Chestnut and Foie Gras Soup course to the Seared Jumbo Diver Scallop with Orange Butternut Squash Puree, with Maple Almond Browned Butter Sauce. For non carnivores, there are also vegetarian options to each course. The main attraction of the whole meal is the entrée. 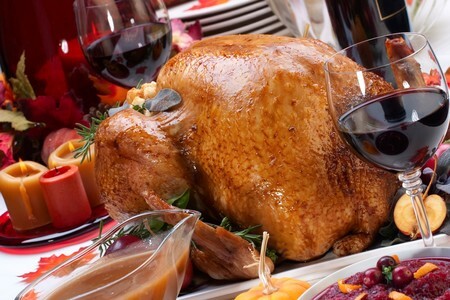 The holiday must have, turkey, is an option, but is prepared with Andre’s twist. The Traditional Oven Roasted, Free Range Turkey, with Apple, Nut, and Dried Fruit Stuffing is only the beginning. The sides for this entrée are Giblet Gravy, Truffled Potato and Green Pea Mousseline, Baby Carrots, Pearl Onions, and Cranberry Relish. Guest can choose among fall favorites like Pumpkin Pie with Cinnamon Ice Cream and Crème Anglaise or Apple Tarte Tartin with Caramel Sauce and Vanilla Bean Ice Cream for dessert. Across Flamingo Blvd nestled on the Las Vegas strip is Chef Rochat’s predecessor for Alize, Andre’s. This Monte Carlo restaurant will also be featuring a prix-fixe Thanksgiving meal this year. In similar fashion, this sophisticated locale wows guests with succulent dishes. Beginning courses come in the form of Warm Onion Tart with Thyme Crème as well as Lobster Sausage in a Spicy Crayfish Sauce. For entrees, there is a turkey dish complete with stuffing, potatoes, and gravy but also various alternatives. Those looking for a seafood dish can enjoy the Roasted Salmon served with Caponata Crust, Lemon Confit, and Sweet Basil. Sides include Angel Hair Pasta and a Tomato Coulis. The desserts featured are the same as Alize’s from the Pumpkin Pie to Baba au Rum with Myer Rum Custard, Chantilly, and Fresh Berries. These two locations each provide an upscale experience for this holiday. From the sweeping views of the bright strip at Alize to the luxuriously décor at Andre’s, family and friends can gather around to give thanks. In true Las Vegas style, Aureole is sleek and trendy. The chic décor of white linen tables surround the centerpiece of the restaurant, its stainless steel wine tower. Holding over 55,000 wines, black clad “wine angels” repel up and down the tower retrieving bottles. This year, the Charlie Palmer restaurant will serve a prix-fixe four course Thanksgiving menu that reflects its simplistic but extravagant décor. Featuring Mille Feuille of Smoked Salmon and Osetra Caviar, Roasted Pumpkin Ravioli and Maine Lobster for the first two courses, this meal will not disappoint. For the main course, Aureole presents a Duo of Roasted Venison Loin and Braised Shank along with Sweet Potato Puree, Foie Gras, and Red Cabbage Spring Roll. Turkey lovers can substitute the entrée with a Roasted New Hampshire Turkey dish, complete with all the dressings. Dessert adds the final touches of sophistication. Guests can choose between Pumpkin Pain Perdue with Poached Pear and Brown Butter Ice Cream or Toasted Pecan Tart with Cranberry Compote and Bourbon Spiked Chantilly. A wine pairing can also be added to meal for an additional $55, and an a la carte menu will be offered in the Main Dining Room. For an upscale holiday meal, Aureole is the place to take family and friends. TWIST by Pierre Gagnaire lives up to its name with its Thanksgiving prix-fixe menu. The purple accented restaurant resting above the Las Vegas Strip in the Mandarin Oriental Hotel blends both class and glamour. This $155 five course meal turns the traditional holiday feast into a taste bud pleasing paradise. The first course of Maine Lobster Tail with Honey-Citrus Paste, Olive Oil Emulsion, Winter Vegetables, and Orange Carrot Cream sets the tone for the remaining courses. The main course, the “Thanksgiving Turkey” is Poached and Roasted Breast, served with Onion Soup, Parmesan Biscotti, Foie Gras Cake, Red Cabbage, and Tandorri Apple. This lavish version of the classic will surely please and excite those who devour it. Le Dessert Pierre Gagnaire finishes the meal with Traditional Arlette, Red Wine-Cassis Marmalade, Fresh Figs, and Roasted Hazelnuts along with Kabocha Squash puree, La Tour Gateau, Mandjari Coupe, Orange Chocolate Cube, Green Tea Cubes, Pineapple Tangerine sorbet, and Tapioca-Coconut milk. A revamped Thanksgiving meal awaits guests at Twist. This sophisticated establishment combines luxury, palate pleasing cuisine, and breathtaking views of Las Vegas. Whether vacationing in Las Vegas over the holiday weekend or a local looking for a luxury night out, these restaurants offer an upscale and decadent dining experience this Thanksgiving. Turn off the oven, put away the serving dishes, and dine out this holiday.